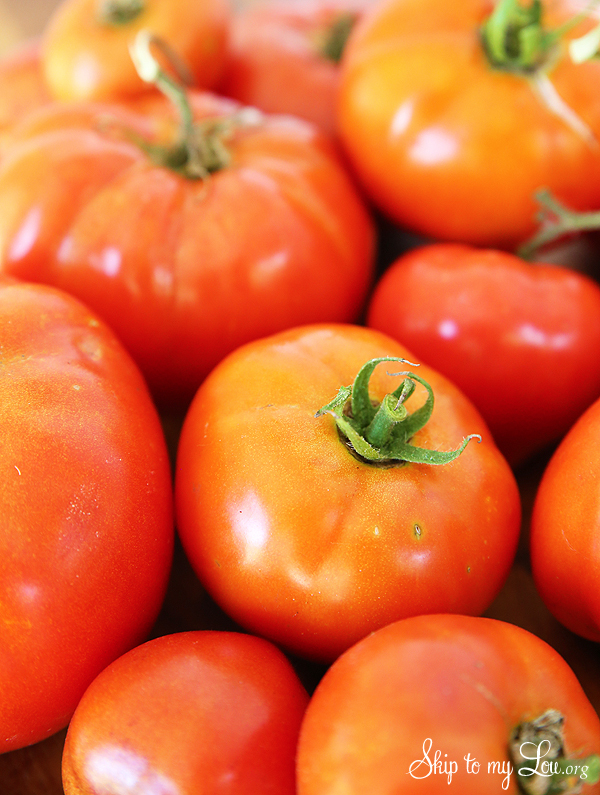 What do you do when your garden is overflowing with tomatoes? 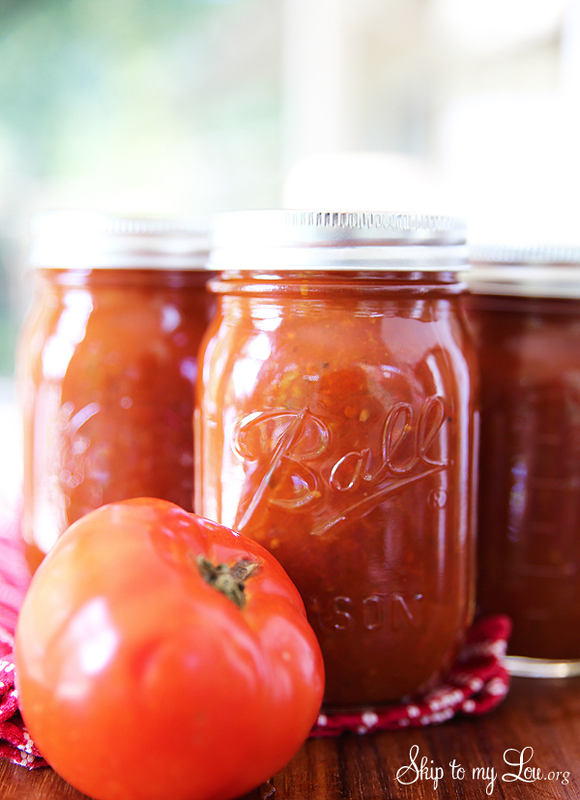 You make homemade tomato sauce! I love to can food. I love to see all the jars lined up! If you like canning you might like these delicious canning recipes: Homemade Apple Pie Filling and Knock of Harry & David Pepper Relish. Now, I must admit making canned tomato sauce was a bit of work! So be prepared! First pick your tomatoes! You will need 22 1/2 pounds! Yes, it is alot! 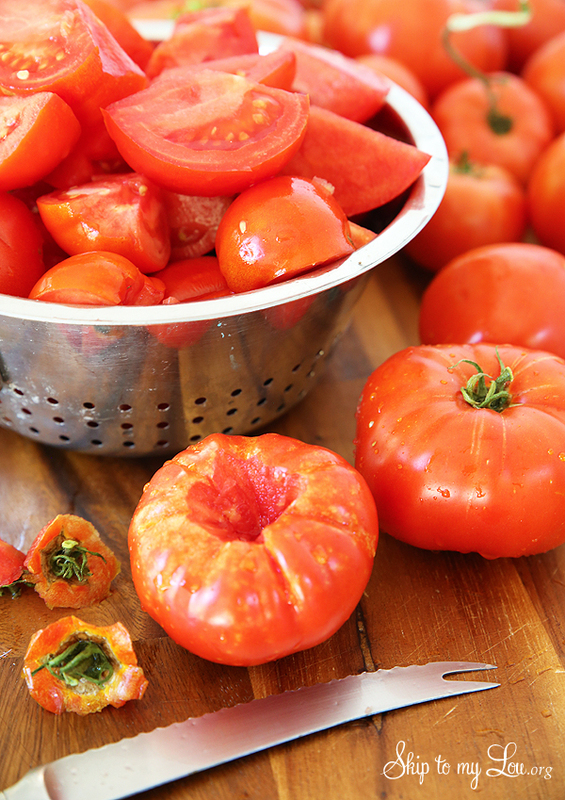 Wash tomatoes under cold water and drain. Remove core and blos­som ends. Cut into quar­ters; set aside. 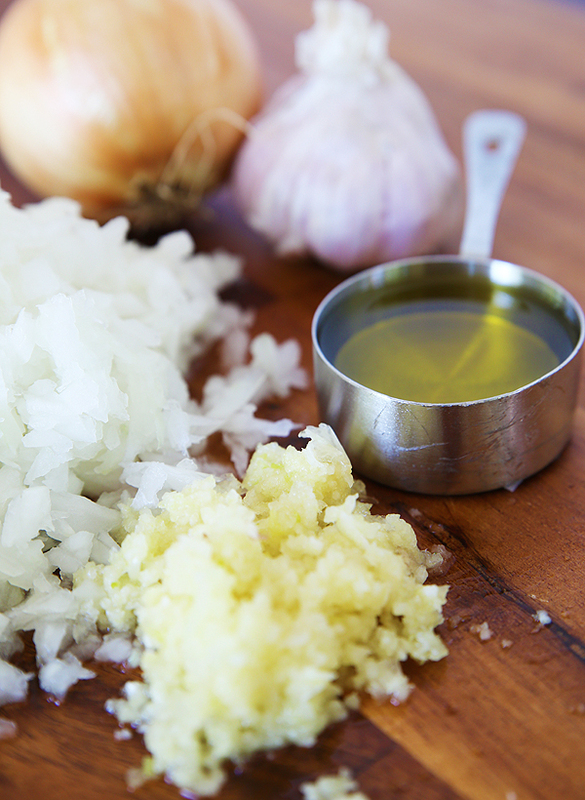 Sauté onions and gar­lic in olive oil in a large stock ­pot. The pot needs to be big enough for all the tomatoes so I actually used the stock pot for our turkey fryer. Add toma­toes, oregano, basil, marjoram, bay leaves, black pep­per, salt, crushed red pepper and sugar. 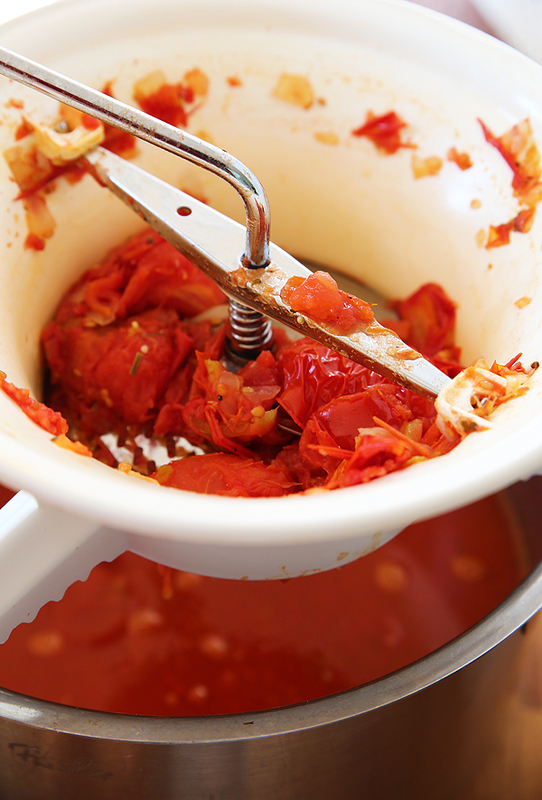 Bring to a sim­mer then simmer 20 min­utes, stir­ring, it may take some time for the tomatoes to reach a simmering temperature. Go slow so you don’t burn the bottom. Remove bay leaves. Pureé toma­toes using a food mill to remove peels and seeds. Place puree into a large pot and cook uncovered over medium heat until reduced by about half and sauce has thickened. Stir often to keep puree from sticking and burning. It took me about 8 hours for my sauce to reduce. Remove from water. 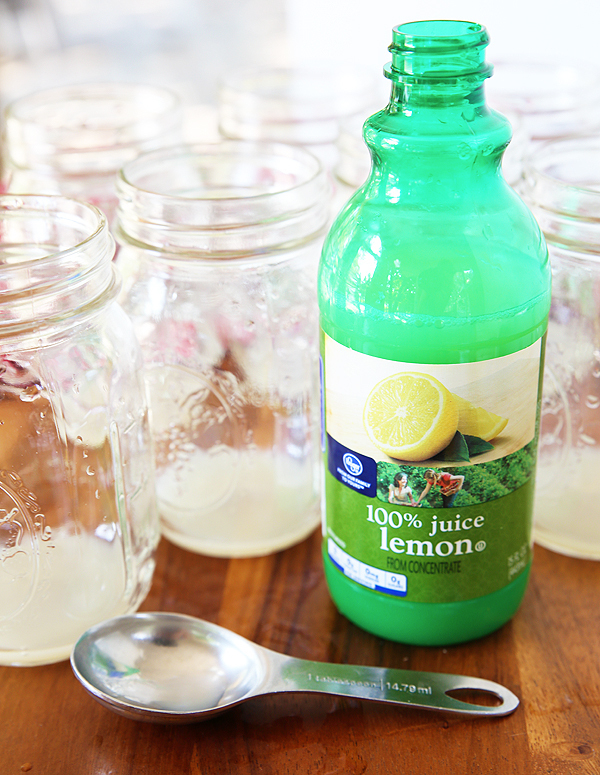 Add 1 tbsp bot­tled lemon juice to each pint jar. 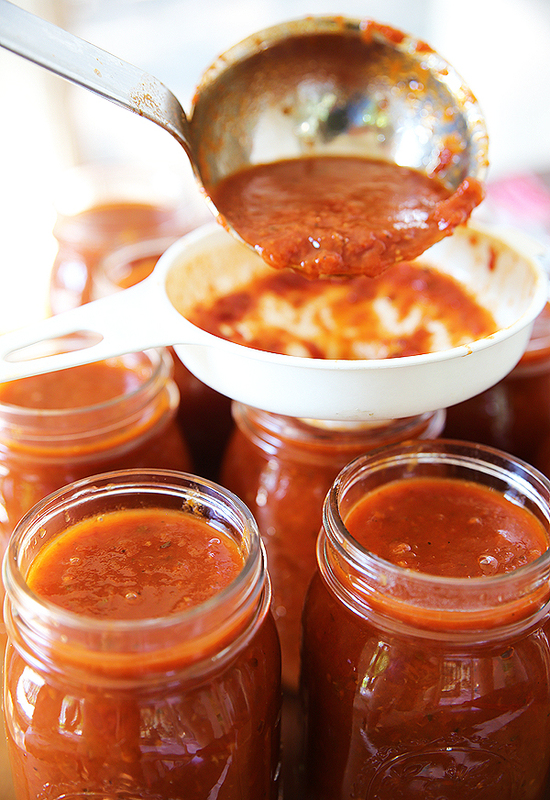 Fill hot jars with the hot tomato sauce leaving 1/2 inch space at the top. 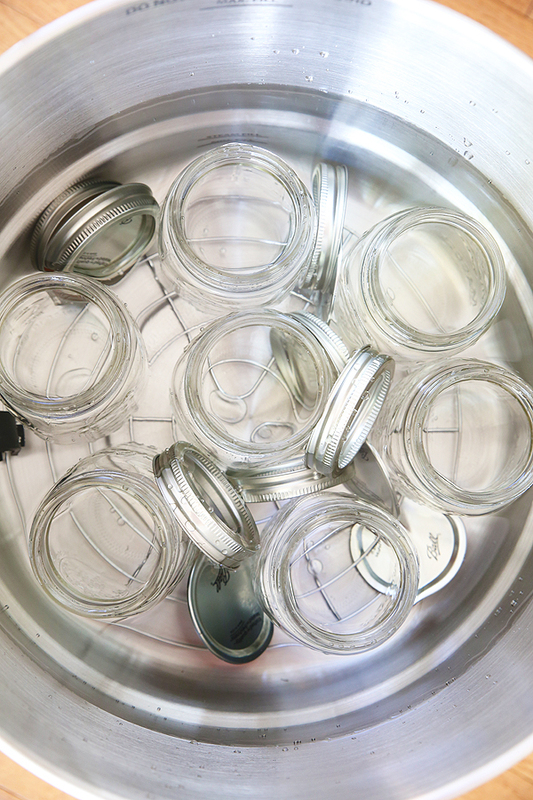 Wipe rims of jars and place on lids and adjust rings to fingertip- tight. Place jars on a rack in pot with water. Water needs to cover jars by 1 inch. I used the new Ball Waterbath Canner. Process jars in boiling water for 35 minutes. Let stand for 5 minutes. Remove from jars. Do not tighten bands. 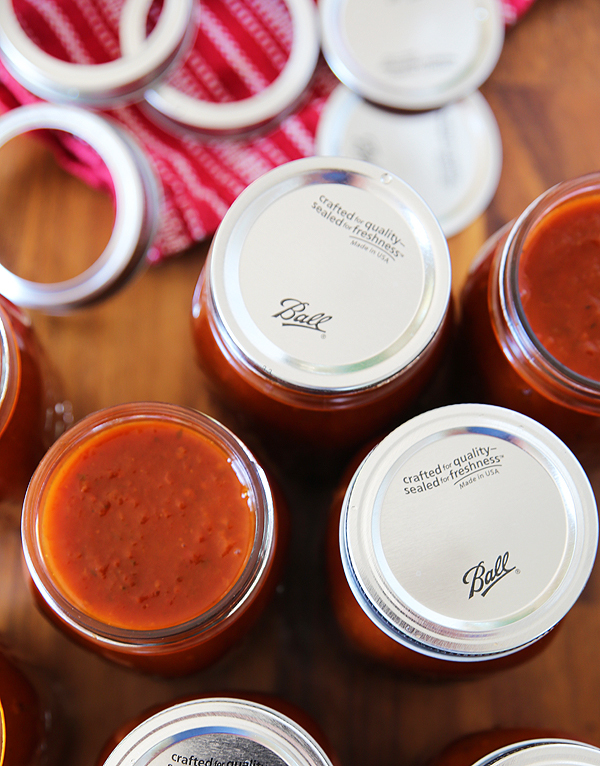 Allow jars to cool for 12 hours. You should hear pinging as the jars seal. After 12 hours test seals. 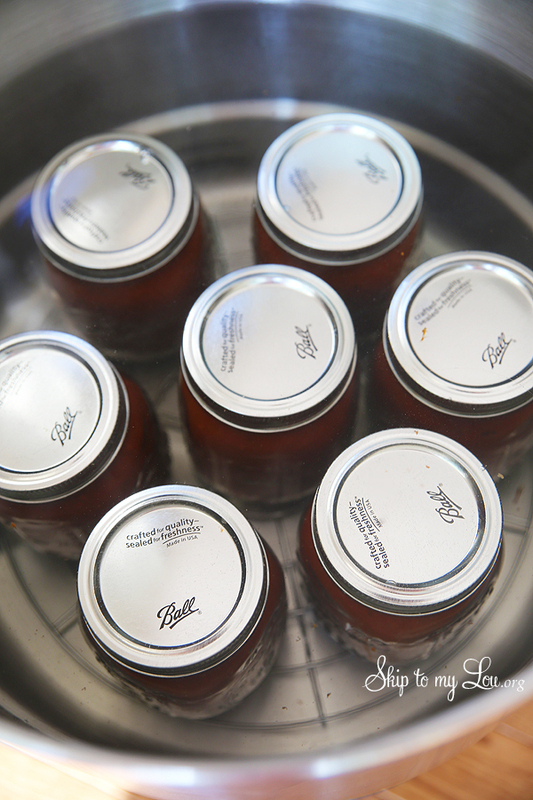 Label and store jars. I am so excited about how I made the labels! I will share on Thursday! Great looking recipe! 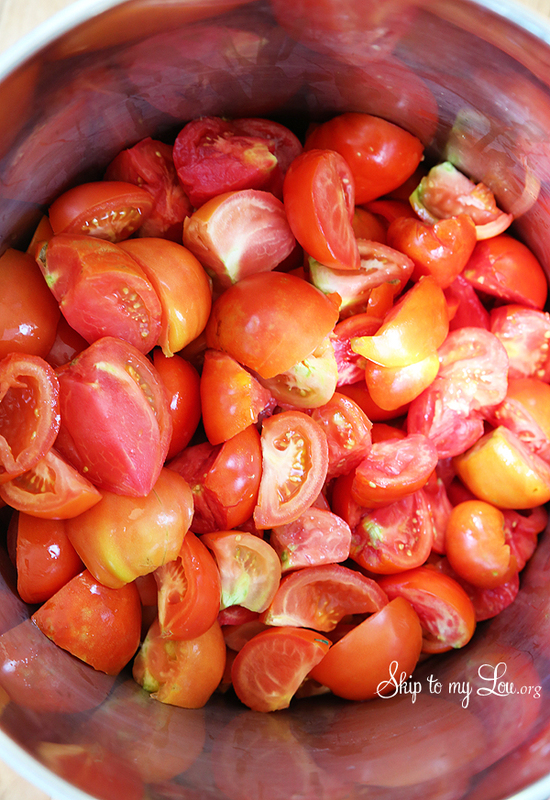 Can I use an immersion blender to puree the cooked tomatoes instead of a food mill? And, why the lemon juice in the jars? Thanks! Immersion blender will not remove the seeds and skin. If you don't mind then by all means you can use it. The reason for the lemon juice is that it is used as a preservative. This recipe is courtesy of K-Paul's restaurant from Paul himself. He gave it to me personally and has never published it. It it to die for. Make sure you have plenty of crusty bread to sop up the sauce. Wash shrimp, divine and pat dry then spread in a shallow pan. Combine remaining ingredients, except bread in a small saucepan and let simmer 10 minutes. Pour over shrimp & mix thoroughly. Cover & refrigerate 2-3 hours. Preheat oven to 300 degrees. Bake shrimp, turning frequently, until they just turn pink, about 15 to 20 minutes. Serve in soup bowls with chunks of French bread. In Cajun country (Southern Louisiana) the bread is dipped into the sauce an eaten along with the shrimp. Serves 8 as an appetizer. 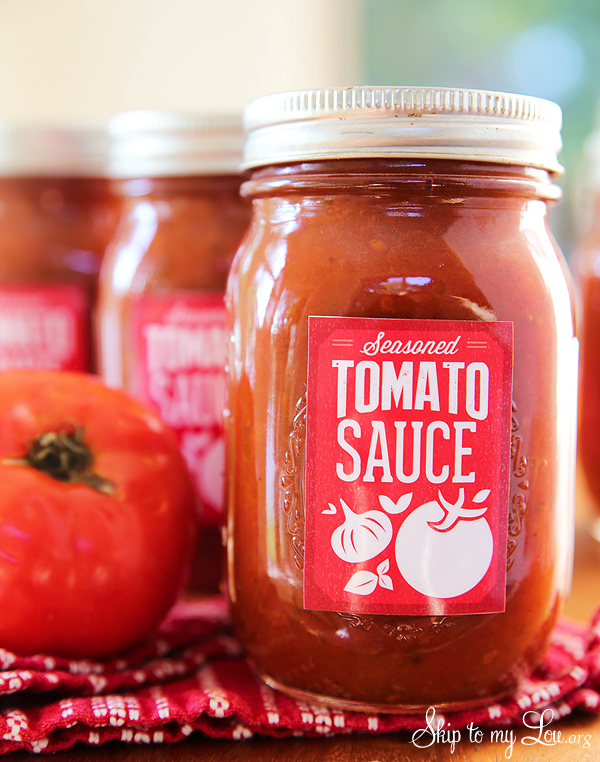 Your tomato sauce looks real good. I'm looking forward to trying it. This looks delicious, and from the recipe I see it will have many uses this winter. Can't wait to try it but in this part of the country the tomato season has not been good. Hope we have a late season as they are green.